Wow, just wow. I was blown away by this book. I mean I had high expectations because of what everyone said but I was still pleasantly surprised at how lovely it was. A word of caution – this was not an easy book to read. I know that I mostly read YA novels so I just wanted to get this out there. It was hard to read because of everything that Sorcha had to go through. The writing is so vivid and imaginative that your heart will break whenever there’s pain and suffering for the main character, which happens several times over. But this book is well worth the trouble. There were times when I had to stop reading because my heart went out to Sorcha, she suffers when she deserves to be happy. The only other Marillier that I’ve read was Wildwood Dancing and though I enjoyed reading that, I wasn’t impressed. 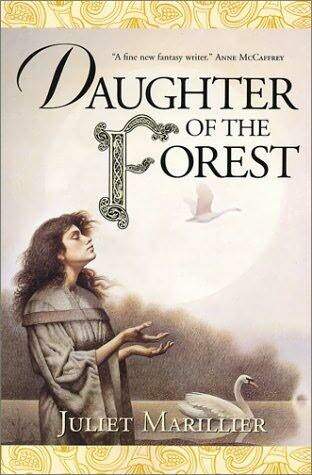 After reading Daughter of the Forest, I can now join the ranks of Marillier fans out there. I enjoy reading fairy tale retellings because it’s always interesting to see where the author will take the story using the fairy tale as the backbone. This one was no different. Using the gist of The Six Swans fairy tale, Ms. Marillier made the story come alive with a wonderful blend of historical fiction and Celtic mythology. Sorcha is the seventh child of Lord Colum, a seventh son himself and Lord of Sevenwaters. As the only girl, Sorcha is well-protected and beloved by her brothers. I loved how distinct each brother’s personality is and how close-knit they are in spite of their differences. They were all tied together by their bond as siblings. Daughter of the Forest is a wonderful story about love – love for your family, love for the land where you came from and true love, which is elusive and comes only once in a person’s life. That speech towards the end of the book is a winner. I’d love to post it here but I don’t want to spoil it for those who haven’t read the book. For those who’ve read it, does “You are bone of my bone, and breath of my breath.” ring a bell? I just got copies of Son of Shadows and Child of the Prophecy from Fully Booked yesterday. Son of the Shadows occurs a generation after Daughter of the Forest and I’ve been assured by Angie and Holly that it’s just as good as the first one in the series. I’m excited to read it! Nice review! I agree, DOTF is so hard to read at times. Sorcha suffers so much, and because nothing’s sugar-coated, we suffer it all with her and it makes the ending so much sweeter. I wouldn’t have it any other way. Marillier fans rule! Holly, exactly! There wasn’t any sugar-coating so it was hard to read. I’m glad it all worked out in the end. I love that last chapter! I kept re-reading Red’s tale. Violet, really, you liked Son of Shadows better? Looks like I’ll like it even more. I’ll post a review when I’m done reading it. I’ve never read this …. sigh. It’s been on my tbr list forever, but so many new books just keep coming out, and I’ve been reluctant to start a new series. Someday! Charlotte, this one can be read on its own! I didn’t even know that it was part of a series when I read it. It really is hard to keep up with our TBR lists. So many books, so little time! Emily, I’ve heard so many good things about Juliet Marillier too and I’m so glad I got to read this. Now I’m curious about the rest of her books. You know how I feel about this series, Chachic. I am SO glad you read DAUGHTER OF THE FOREST. It’s an absolute gem and a top comfort read for me. I never tire of it. And Violet is NOT kidding. SON OF THE SHADOWS is every bit as good. You won’t believe it. I hope you get a copy soon because I’m all jumpy to hear what you think. I adore this book. And yes, it is such a hard read. Sorcha goes through some truly agonizing moments and I just wanted to get someone to hold her close and protect her!! Can’t wait to hear your thoughts on SotS. It is a WINNER too. Angie, this certainly calls for confetti! It was so hard to get this book but I’m so glad I got a copy. 🙂 I already have a copy of Son of the Shadows and I’m so excited to read it. I just need to finish Endless Summer, which I’m reading now and I’m all set to dive back in the story of the Sevenwaters clan. Michelle, I felt the same way! I just wanted someone to be there for her and comfort her. That’s why it was such a relief when Red came along. Oh Red, so sweet. It’s great that so many of us love this book. It’ll be easier to spread the word around. Oh my goodness! I remember seeing this on goodreads that you were reading this series and I was so giddy because I had just discovered them as well and I was so excited to see how you liked them and it is only now that I’ve had time to look at your blog and now I’m reading through your reviews of the series and devouring them like candy drops! I love it!